These rugged units are designed to meet height restrictions that cannot be obtained with standard hoppers. Used under presses, conveyors or work stations where space is a premium. Lids not available. FOB Shipping Point. 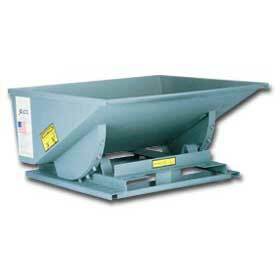 For Caster Options See: Self Dumping Hoppers Caster Options. Product No. Cap. Cu. Yds. Cap. Wt. (lbs.) Size L x W x H Fork Openings Wt. (lbs.) Price Ea.